What happens when you combine the capabilities and experience of one of the world’s leading bespoke superyacht builders with one of the world’s top luxury sports car manufacturers? An unprecedented design of class, sport and elegance is born. 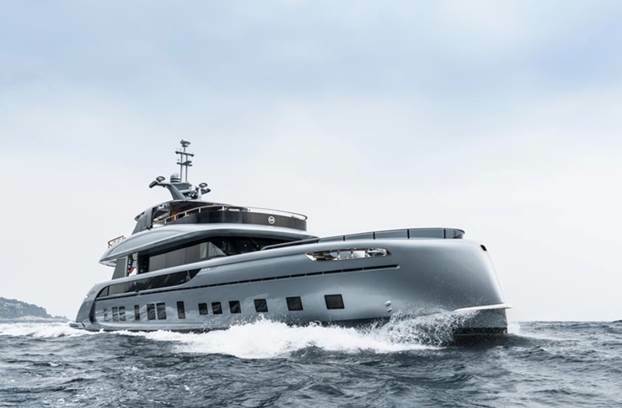 Acclaimed Italian superyacht builder Dynamiq, known for its bespoke and award-winning builds such as the 39m “Jetsetter” teamed up with world renown automobile manufacturer and design studio F.A. Porsche to create a superyacht that would “take the spirit of high performance sportscar styling to the high seas,” according to F.A. Porsche Managing Director, Ronald Heller. 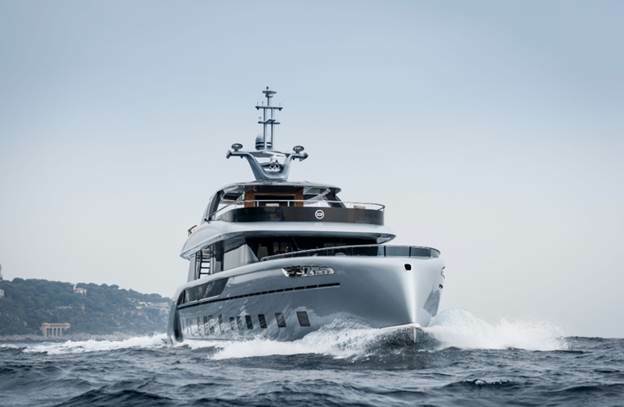 The result of their collaboration is the award winning GTT 115 Hybrid which was acclaimed with the 2018 Best Naval Architecture award in the semi-displacement category at the 2018 Boat International Design and Innovation Awards. The GTT115 combines Dynamiq’s heritage of excellence with the legendary design capability of Studio F.A. Porsche. It is the world’s first superyacht with Porsche DNA and only seven will ever be built. Porsche is responsible for designing the exclusive exterior of the GTT 115 and offering Porsche line exterior colors including “Monte-Carlo Blue” and “Chalk”. The exterior is one of many aspects of this vessel that sets the incredible GTT115 apart from its competition. 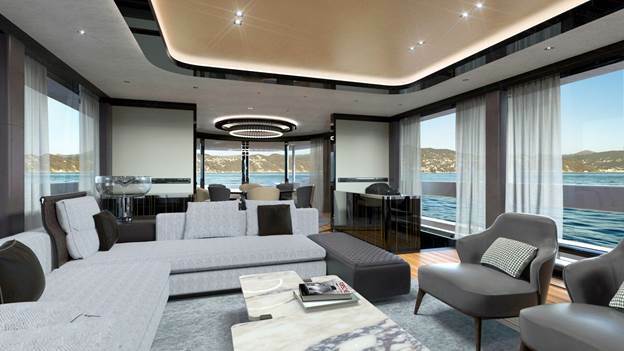 A sumptuous and elegant interior combined with an award-winning design round out the entire package to create a truly remarkable super yacht. When it comes to performance and naval architecture design, the GTT 115 shines. Thanks to unique innovations such as the Hull Vane designed by Dutch naval architects Van Oossanen, which reduces hull resistance and ultimately allows for longer range and increased fuel savings, the GTT 115 boasts impressive performance capabilities. Its fast displacement hull form allows for a top speed of 21 knots, made possible by twin Fortjes 5000 POD drives with contrarotating propellers. With the pace backed down to 10 knots the GTT 115 has an incredible, transoceanic cruising range of 3,400 nautical miles – enough to take you just about anywhere you could desire. If you want to really slow down and enjoy the trip in complete silence, look no further than the GTT’s amazing hybrid configuration. With the main engines off the GTT is capable of traveling at 6 knots in silence thanks to twin 20 kW electric motors driven by Fischer Panda iSeries generators. The Dynamiq team had the foresight to place the generators in the bow to ensure guests wouldn’t notice and fumes or mild noises while relaxing and swimming off the stern. When the going gets rough there are four Humphree designed electric stabilizer fins to ensure the motion is never uncomfortable. The electric stabilizer fins also work at anchor to ensure that even at rest all guests onboard are comfortable and able to enjoy the activities and adventure. When it is time for adventure with the tender or other toys, look no further than the forward garage. An extremely innovative feature for a yacht this size, the GTT’s forward garage is capable of carrying a 15’ tender and jet-ski for rapid deployment at a moments notice. 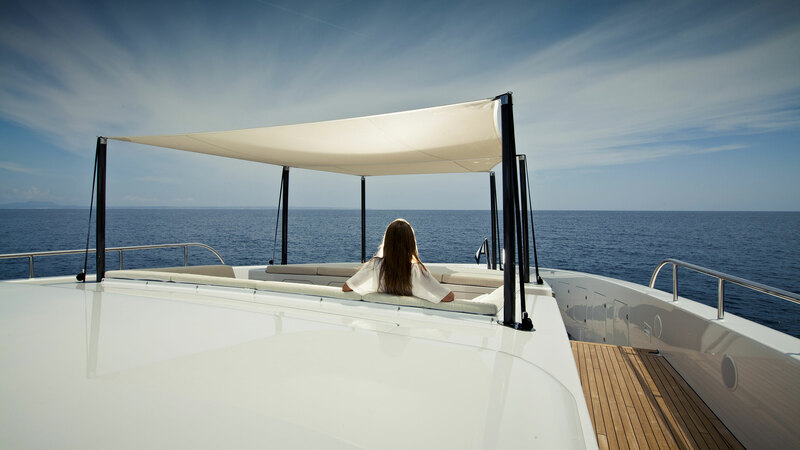 When it is time to wind down and relax on passage, at anchor or in port, the GTT 115 delivers in spades with an interior layout and quality that is sure to please even the most discerning guest or buyer. Available with two primary layouts of three or four cabins, there is a full-beam master that is completely private with a walk in closet and large head. Both VIP cabins include large ensuite heads with their own hanging lockers. Crew accommodations are also generous with room for up to six crew members across three cabins. Dynamiq and Studio F.A. Porsche truly set a new standard with their collaboration on the GTT 115. 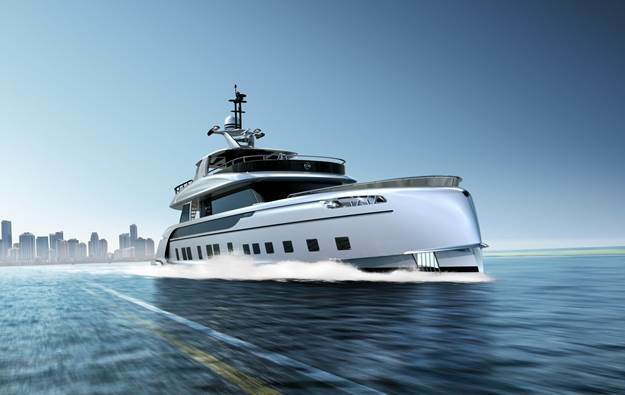 They successfully created a timeless superyacht that brought high performance supercar styling and capability to the sea. 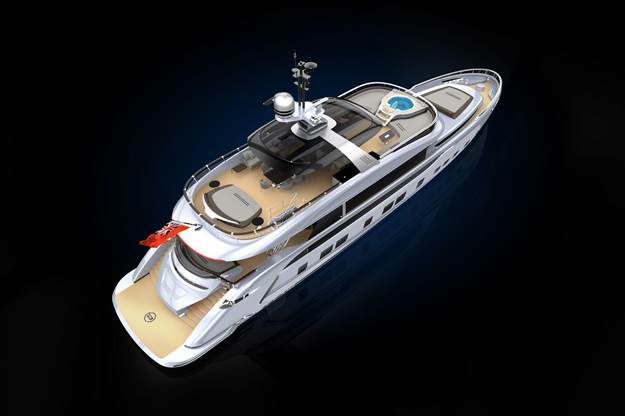 With only seven being built in total, the GTT 115 is a yacht that will remain recognizable for generations to come.